The unique Vortex-Fusion® serum delivery system sets the HydraFacial MD® apart from other procedures. We use antioxidants, peptides and hyaluronic acid during a HydraFacial treatment. A HydraFacial cleanses, exfoliates and extracts impurities like blackheads and dead skin cells. This treatment also replenishes vital nutrients to your skin. These ingredients are able to lessen skin damage and reduce the look of fine lines and wrinkles. As a result, your skin will feel plump and firm, leading to long-term results you can see and feel. We aim to alleviate some of your most common skin concerns. We do this by targeting the problem and creating a customizable solution for you. 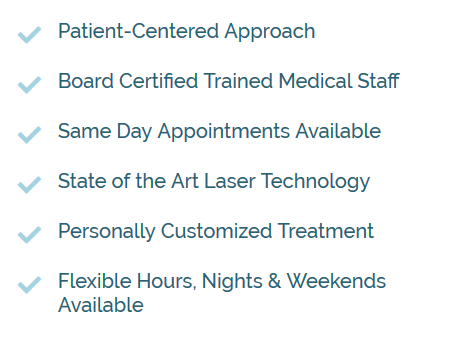 Our goal is to tailor this treatment to safely and effectively address your specific skin concerns. We will create a plan that has the most impact for your unique needs. Your skin isn’t like everyone else’s and your treatment shouldn’t be either. Lets schedule your consultation today.